Finding out about Darlington South Park parkrun volunteering opportunities couldn't be easier. Simply open a recent parkrun newsletter, results email or volunteer email, click on 'manage my profile', then 'email options', then select the events you'd like to hear from and click 'save opt-in events list'. You will then receive regular emails from those events letting you know all about their volunteering opportunities. You can see an event's future volunteer roster via their specific future roster page. To get in touch with the event directly, just send an email to darlingtonSouthParkhelpers@parkrun.com. Darlington South Park parkrun happens largely because of our fantastic volunteers, who are almost all regular runners like you. 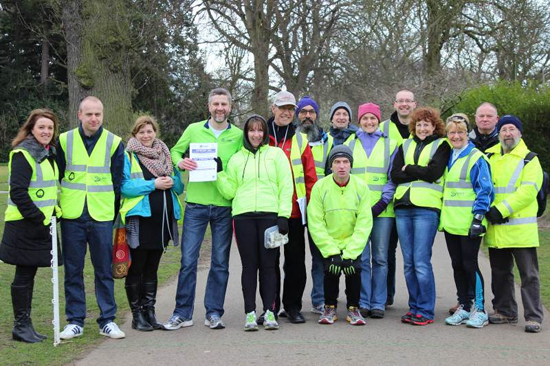 The weekly team of volunteers are led by a small group of parkrun enthusiasts who form what we call the 'core team': They make sure the event is setup and packed away each week, the results published, the tokens resorted, event reports written and so much more. Ian Barnes (Co-Event Director) - Ian is a qualified middle distance coach and a level 2 track judge. Now retired, he is delighted to be able to compete in master (veterans) athletics and finds that there is no age barrier that prohibits those who wish to continue competing. Ian feels the NHS investment in Darlington South Park parkrun has really paid dividends for the local community in terms of health and enjoyment, as every Saturday morning now almost 400 parkrunners assemble in the park ready to run and socialise. Emma Joyeux (Co-Event Director) - Emma started running in 2011 to raise money for charity. Whilst not a runner who’s going to break the 25 minute barrier or be the first runner home, Emma enjoys running (sometimes) in order to keep fit and occasionally will try to get a bit quicker! Emma, who is now a mother of two small children can often be seen running with a running buggy. A regular Run Director and volunteer, Emma is part of the on-line team - processing the results, organising volunteers and looking after the social media profiles. Emma is also a member and qualified Leader in Running Fitness at the Quakers Running Club. Allen Hazlett - Allen has recently retired after 33 years working in local government as a Special Educational Needs Adviser. He ran his first Marathon at age 57 and his second, and definitely his last, at 58. Allen is part of the Run England Group in Darlington and enjoys the social aspects of running. He also still plays 5 a side football and tennis, and has acquired quite a few mountain bikes. He thinks parkrun is great and enjoys being part of such a supportive community where performance and effort irrespective of ability can be celebrated by all. Harry Singh - Harry needs no introduction to those familiar with Darlington parkrun. Always found marshalling on ‘Harry’s spot’ calling out splits and estimated finish times, Harry is also responsible for the set-up, close down and equipment storage. A keen runner for Darlington Harriers & AC, Harry has completed all 37 Great North Run events and a staggering 125 marathons. Karen Harland - Karen became involved in taking photographs of runners when her son Dean joined Quakers RC and she was asked to take photos at Darlington parkrun ? which she has done ever since. Although a non-runner, parkrun has become a major part of Karen’s life. Her passion for taking photos at parkrun stems from seeing runners achieve their goals; the excitement on children’s faces when they have completed the run; runners achieving PB’s; people who never thought they could run being able to run a 5k, and lastly families participating or supporting the event. parkrun has become a way of life for Karen and she has made several lifelong friends from this event. She loves meeting new people and the knowledge that her photos show a runner’s journey for them to look back on is very rewarding. Paul Ryan - Paul only started running in his 40s when he was persuaded to come along to parkrun. Since then he's done over 100 parkruns, he has joined Quakers Running Club and has run (slowly!) many races from 1 mile to marathon! He enjoys being a Run Director, shouting encouragement to other runners and can often be seen later on Saturday mornings huddled over the laptop processing the results. He also never shuts up about parkrun at work, meaning now around a quarter of the company he works for now do parkruns around the northeast!! Olly Moore - Olly started running when he turned 40, after foolishly accepting a dare to complete the London Triathlon for charity. The whole fitness thing escalated more than he expected, eventually leading to a couple of marathons - although he's vowed never to do another! He loves the inclusivity of the parkrun community, and enjoys a social parkrun more than striving for faster times. Olly is a parkrun Event Support Ambassador in the North East region. A self confessed geek, Olly especially enjoys the results and statistics element of parkrun, and often looks after the back-office volunteer roles. When not parkrunning, Olly is Membership Secretary and Web Admin for Quakers Running Club. Lee Morris - Anyone who knew Lee up to the age of 35 will be surprised to see him consider himself as a runner. He was, and is, heavily involved in music and drama and is an active member of Darlington Operatic Society, but has developed a love for running. Lee has embraced both the physical and mental health benefits of running. A keen member of Quakers Running Club, and a qualified Leader in Running Fitness, Lee is a fanatical parkrun enthusiast he has completed all but four parkruns here in Darlington. He’s never going to win a prize for his running, but he has bags of enthusiasm, and a very loud voice - you might have heard him encouraging you to “KEEEEEP RIIIIIIIGHT” on a Saturday morning! Aaron Sparrow-Woods - Aaron only started his parkrun journey in December 2016 and is still very much a beginner to running but enjoys parkrun due to how inclusive it is. After a significant injury Aaron was unable to run for a while so decided to volunteer and since then has enjoyed coming down to parkrun every Saturday morning whether he is running or volunteering. Aaron likes to mix up the volunteer roles that he takes on each week whether it is looking after the volunteer rosters during the week, scanning barcodes or even being Run Director. Hilary Bevan - By day a VAT geek, by night a punk, and fledgling runner in between. After a slow start in 2015, Hilary fell in love with parkrun in 2016. At the beginning of 2017 Hilary had never run further than parkrun but after joining Darlington Harriers & AC, she completed her first half marathon in October 2017. Having never been remotely athletic, this new found hobby was quite a surprise. Hilary loves parkrun for its inclusivity and the fact that anyone can join in, however fast or slow, and whether they are a brand new or an experienced runner. Hilary is often found setting-up and closing down parkrun or giving the First Timers briefing and is also one of our results processors. We're very grateful to the help provided by everybody, both now and in the past, who've helped make Darlington South Park parkrun happen.